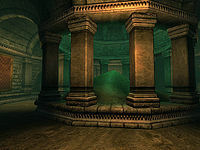 Greenmote Silo is a small cave under New Sheoth Palace containing Golden Saints (quest-specific). It contains only one zone, Greenmote Silo. 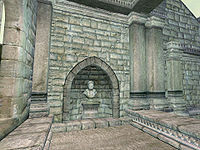 This area only becomes accessible during the related quest, Ritual of Mania, when Thadon's assistant, Wide-Eye, causes the bust of Sheogorath covering the entrance to move, revealing a secret doorway that was previously inaccessible. The Golden Saint guards who patrol this area happen to be the NPCs who rapidly use FormIDs, and therefore triggered the Shivering Isles Reference Bug. 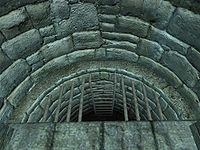 If you chose to kill Syl, you will never be able to enter the silo, as a guard will always be standing at the entrance telling you that the area is off limits. Even if you were to sneak past her, you still can't open the door to the chamber because of a bust of Sheogorath that covers the entrance. A large number of Invisibility potions is very helpful. A high Alchemy skill makes this more practical. The entrance to this zone is located at the north end of the main gardens in New Sheoth Palace. Until you start the related quest, there is statue of Sheogorath hiding the entrance. It does not have a map marker. As you will need to enter and exit without being spotted by the four guards constantly patrolling the area, you will need to time your movements carefully and get a feel for the guards' routines. One guard patrols the first large room with three chests, a second walks up and down the tunnel from Out to the central-most room, a third loops around the aforementioned tunnel and another to the north of it, while a fourth moves on a north-south axis from the central room all the way south to the west-turning bend in the tunnel. Upon entering, make sure the second and third guards have their backs to you and head east, north at the three-way junction and east at the next intersection, again checking that the two guards are heading west. Make sure to loot the two hollowed stumps on your way. Enter the next room and jump over the Mushroom Tree Saplings in the southeastern corner, hiding in the dark recess there. The second and third guards poke their head into the northern edge of the room once in a while, so wait for them to do so and for the fourth guard to have started heading south again. Jump out and head east, stay on the upper level of the next room, hug the walls and proceed south. Here use the roots to jump to the raised area to the south where you will find a hollowed stump. Jump down and head east until you reach the silo and position yourself in the northeastern area (next to D), where you can safely harvest the Greenmote. Wait for Wide-Eye to leave and check out the area at E for some alchemical equipment. Backtrack to the previous room and go south, follow the tunnel and halt at the top of the steep path in the shadows. Once the fourth guard is heading back north, follow her and then turn west and south to access another hollowed stump. Head west and stop in the dark at the next intersection. Wait for the second and third guards to pass on the other side of the room, and for the second to do so again. Then, when the first isn't looking, sprint west until you reach the exit. Attempting to loot the chests in this area is possible but requires a very high Sneak skill and probably some Chameleon too. 4 Golden Saint Guards. 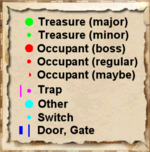 The positions shown on the map are their initial locations, but each guard has a patrol route through the cave and can therefore be encountered far from the initial location. This page was last modified on 3 June 2017, at 18:44.